As was recently spelled out by my colleague, Dan Moren, Napster has rejiggered its music subscription plan so that you can listen to its streaming music library (comprised of over 7 million tracks) and download five DRM-free 256kbps MP3 files for just $5 a month. As I’ve made pretty clear over the last few years, I like music subscription services—not as a substitute for purchasing music I like, but as an enhancement to my music listening. Say what you will about owning your music, with a subscription service, your music library is larger than that of the person without such a service. I’ve been a Rhapsody subscriber for a number of years and haven’t regretted it. In league with my Sonos Multi-Room Music System I’ve blasted Rhapsody’s massive music library from one end of my home to the other and have listened to and discovered some great music. But I pay $13 a month for that privilege and no free downloads are part of the package. Paying $5 a month and getting five high-quality downloads to go with it (thus paying for the subscription service) was too tempting to resist. Unless you have something like a Sonos system, use Rogue Amoeba’s $25 Airfoil for streaming your Mac’s audio to an AirPort Express or Apple TV, or have directly connected your Mac to your audio gear (as you might if you’ve set up your Mac as a media center), a subscription music service is going to limit you to playing music on your computer via a Web browser. Napster claims it's compatible with Firefox only on the Mac but I used it with the Safari 4 beta without complaint. Napster’s site is similar to Rhapsody and Amazon MP3 (though less cluttered than Amazon MP3 thanks to a more tab-heavy interface). You see four new album releases, a couple of popular playlists, a list of top 10 tracks, some staff picks, and an excerpt from the Napster Blog. To view longer lists of items—new releases, staff picks, Napster playlists, top artists and albums—just click the appropriate tab. To play a track, playlist, or album, just click the Play button next to the item. A small Napster Player window appears that includes a list of tracks queued for play along with play controls. 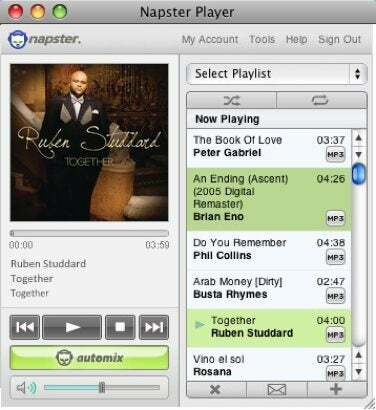 Here you’ll also see Napster’s Automix button. This is a helpful button and akin to iTunes’ Genius feature. Just start playing a track and click Automix and Napster will create a playlist of tracks it thinks you’ll like from Napster's library and place them in the player. This is a nice way to discover new music. Another way to listen to music you may like is to tune into one of Napster’s radio stations. These are 62 stations arranged by genre—R&B Essence, Ultimate Electronica, Children’s Favorites, Classic Rock Gold, and New Release Radio, for example. Select and play one and Napster feeds you music from that genre. As with any other music in the player you can add playing tracks to your library or to a playlist you’ve created. You can also click a Share button in the player to compose an email message that includes a link to that track on Napster. Those tracks that can be purchased (or downloaded as one of the “free” five per month) have a small MP3 icon next to them. Click the icon and a Confirm Your Purchase window appears that lists your track. To download it, click a Buy MP3 button and the track is added to a Track Purchase History window where you can finally download the thing by clicking a Download button next to it. When you do, the track downloads to your Mac and is automatically added to iTunes. Clumsy? Oh yeah. Napster has built an application for making tracks easier to download in one fell swoop, but it’s regrettably for Windows only. And this is kind of typical of the Napster experience—a little rough. For example, MP3 credits don’t roll over. If you haven’t used them in the month they’re issued, they vanish. (You can work around this by purchasing either a three-month or year plan so that your credits roll over only every three months or once a year.) The Napster Player window doesn’t include a Search field so if you want to look for music, it’s back to the main Napster window. And I’ve yet to be able to find a way to remove an MP3 files I’ve queued for download but then later decided to not purchase. And while Napster talks about its 7-million track library, you can’t stream every one of them. For instance, I looked through Peter Gabriel’s catalog with the idea of playing “Humdrum” from the Plays Live album. No dice. Napster allows you to play only 30 seconds of each song on the album. Rhapsody, on the other hand, is more than happy to have you stream every song from that album in its entirety.